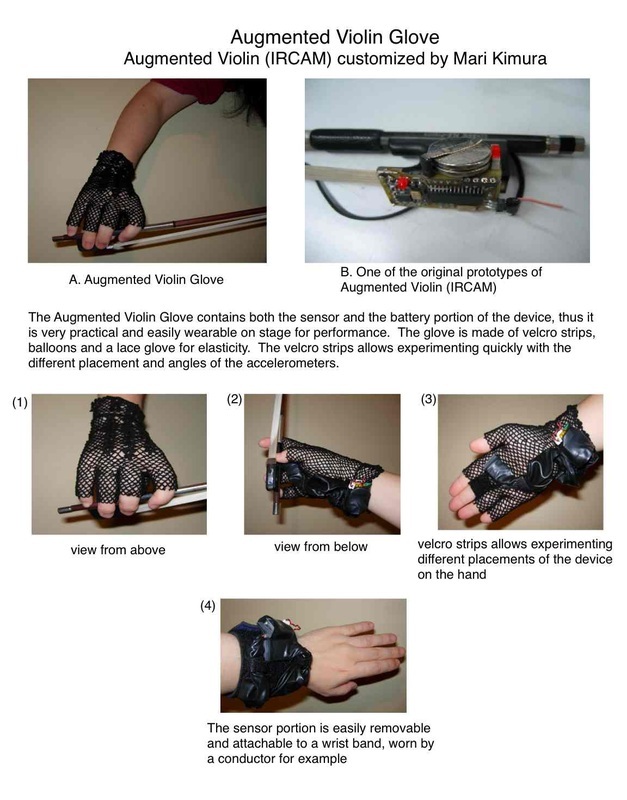 1) This is the very first generation of the Augmented Violin glove. I created a do-it-yourself glove, attaching the sensor, circuit board and battery portion onto a glove. 2) in 2009, Mark Salinas of "Arrows-Up" contacted me after he saw my performance in 2009 in NYC, and proposed to design a glove for me. This is the Augmented Violin glove designed by him, much more elegant and discreet. It is housing the xbee sensor at the bottom of my index finger on the palm side. In 2013, I inaugurated Future Music Lab at Atlantic Music Festival, where chosen Fellows will have access to using MO sensors with their instruments. In 2016, my collaborator Liubo Borissov and I created a new prototype we are calling 'µgic', an arduino 9-axis DIY sensor. Future Music Lab 2016 fellows used these units.